The ideal cost-effective solution for automated monitoring and managing of time & attendance for any type of business, with advanced secure biometric fingerprint verification. Betaland TimeClock™ package is a complete solution for automated employee’s time & attendance recording, control and management, providing and producing efficient and professional work hours reports. 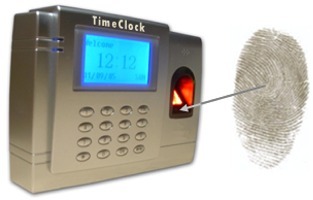 Our professional clock with fingerprint biometry boasts integrated biometric employee recognition. An employee simply passes his card then places his finger on the sensor for authentication. TimeClock™ then verifies the matching identification of the employee, based on the original enrollment print in the database, and prompts that employee by name, to continue the transaction as required. Using TimeClock™ software, the user can load the transactions to a PC at regular intervals (daily, weekly or even monthly) and manually modify the transactions if necessary. 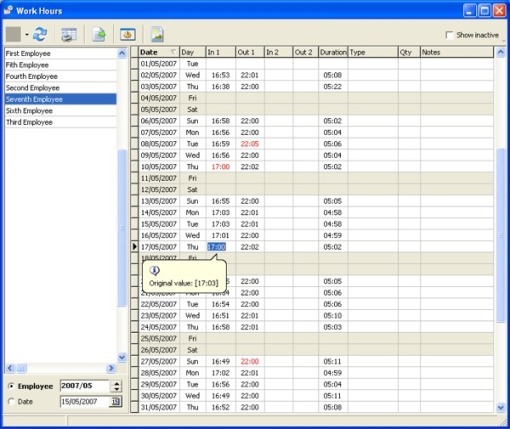 TimeClock™ processes the data according to user-defined rules “contracts” associated with each employee (including rounding, shifts, holidays, vacations, overtime, etc.) and produces a set of various reports, which present the transactions, along with the system computations. The processed attendance data can also be exported to any external payroll software. • Global insertion of holidays, vacations, etc.